The Silent Hour isn't one of those Michael Koryta gothic horrors or supernatural noirs that you read trembling under the bedcovers. Rather, it's the fourth book in his Lincoln Perry series, about a former Cleveland, Ohio police detective turned hardboiled private eye. Lincoln, who narrates, is a skilled and relentless investigator. His partner in Perry and Pritchard Investigations, widowed ex-cop Joe Pritchard, has been in Florida for months, recovering from gunshot wounds and contemplating retirement. Lincoln is considering retirement too. He misses the companionship and advice of Joe, a naturally cautious man, who as a kid "probably did background checks on the neighbors before trick-or-treating at their houses." Money from a job Lincoln did for his ex-fiancée could remodel the gym he owns. He's tired of putting his girlfriend Amy in danger and hearing the security bar go across her apartment door as he leaves. Is it, then, any wonder that when he receives a series of letters asking for help from convicted murderer Parker Harrison, Lincoln tosses them into the garbage? Months later, the persistent Harrison himself shows up at Lincoln's office. He doesn't want Lincoln to investigate the murder that sent him to prison, but the whereabouts of "kind, compassionate, beautiful" Alexandra Cantrell, who dreamed of helping released violent offenders reenter society. She and her husband Joshua developed a program that tried to connect parolees with nature at their special house in the woods, Whisper Ridge. Upon leaving prison, Harrison joined them there for a year. Then the Cantrells disappeared without a trace. That was 12 years ago. Now, Harrison tells Lincoln, "I see you as a storyteller. You take something that's hidden from the world, and you bring it forward, give us answers to our questions, give us an ending. It's what you do, and you seem to be very good at it." That's true. Lincoln takes the case and it isn't long before he's deeply disturbed. Carved beside the door at Whisper Ridge is a strange epitaph, "Whisper Ridge—Home to Dreams—November 6, 1992-April 27, 1996." He discovers that Joshua's skeleton was unearthed in Pennsylvania six months earlier, right before Harrison began writing him. In addition, one of the parolees died mysteriously shortly after leaving the Cantrells. It's clear that Harrison is not being open and honest. To make matters worse, Lincoln learns that Alexandra comes from a major Youngstown, Ohio mob family and her uncle, Dominic Sanabria, pays Lincoln an unwanted visit. Dominic states that he liked Joshua and says of the missing Alexandra, "Every family has their darling, and she is ours." The dual nature of the characters makes Lincoln's investigation very challenging. Do-gooders Alexandra and Joshua have connections to the Sanabria mob. Although Harrison and the Cantrells' other parolees are murderers, they have stayed out of trouble since their release. How far can they be trusted? What about Dominic? Lincoln wants nothing to do with an investigation that touches the Sanabria family. He continues, at the request of Pennsylvania cop Quinn Graham, working on Joshua's homicide, and Pittsburgh PI Ken Merriman, hired by Joshua's parents when he first disappeared 12 years earlier. Ken is reluctant to quit because he dreams of impressing his 14-year-old daughter. In some ways, Graham, Ken and other law enforcement officers interested in bringing down Dominic Sanabria are almost as troublesome for Lincoln as the criminals. They're jealous of their turf, hampered by a lack of resources and blinded by obsession. Lincoln can't entirely trust them either. The case isn't solved before Joe's return from Florida, another murder and so many plot twists and double dealings that Lincoln's inquiries reminded me of a ball making its way through a pinball machine. It's no wonder Lincoln ponders his commitment to life as a PI. That night strips of coal-colored clouds skidded over a bright three-quarter moon, pushed by a spirited wind off the lake. I sat on the roof of my building and marveled at their speed, stared long enough that the lights and sounds of the street below faded and I was held by the rhythm of the clouds, by the vanishing and then resurfacing moon. If I looked long enough, it seemed I wasn't on the roof anymore, could instead be miles out at sea, nothing in sight but that moon and those clouds. Yeah, I'd had a bit to drink. I cared about what happened to Koryta's complex characters. Lincoln, introduced in Tonight I Said Goodbye, is a classic shamus in the manner of Ross Macdonald's Lew Archer or Raymond Chandler's Philip Marlowe. 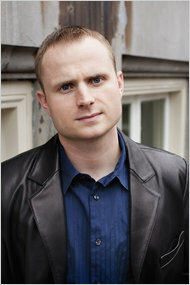 Since The Silent Hour was published in 2009, Koryta has written four stand-alone novels. I hope he'll give us another Lincoln Perry book soon.